1 piece steel fixing with screw. Anti-rotation teeth pierce plasterboard to ensure firm anchorage. 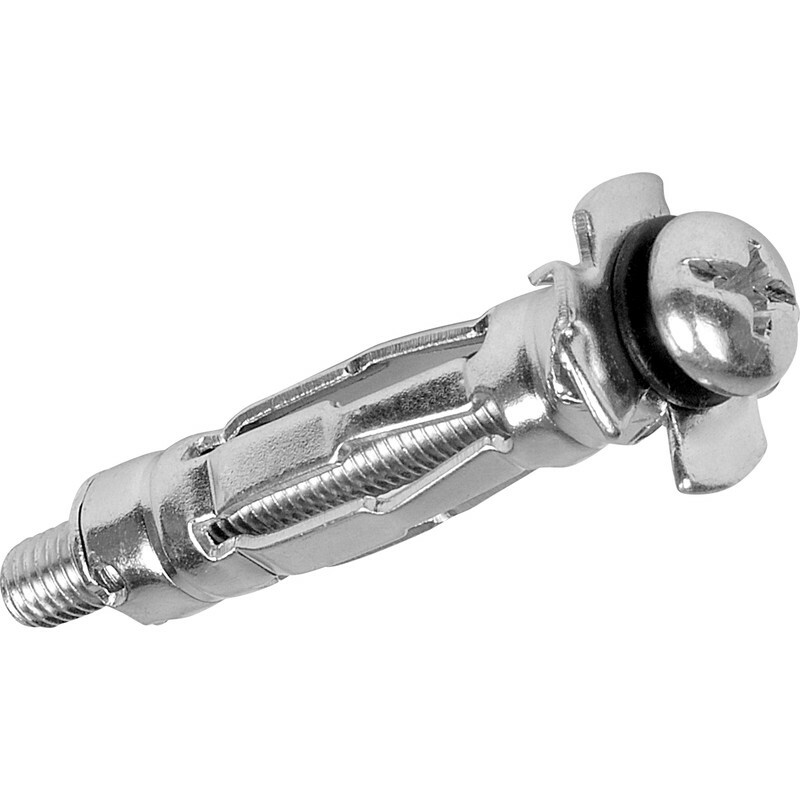 Hollow Wall Anchor 6 x 65 (10 Pack) is rated 3.7 out of 5 by 36. Rated 5 out of 5 by AJ Techteacher from The ones to use! Great fasteners but use the setting tool to help the installation which is available in this site too. Rated 5 out of 5 by Snuggles1406 from They do their job Make sure you use the setting tool every time. Generally reliable and load trustworthy! Rated 5 out of 5 by Snuggles1406 from They do their job Good quality reliable fixings (make sure you use the setting tool, it's much more reliable, and less likely to brake the nut, or fail to set the fins properly). Great VFM. Rated 3 out of 5 by Pud1 from Disappointing. Two out of ten disintegrated in the wall. Disappointing. Rated 3 out of 5 by MRSJ Properties from Does the job (most of the time) Just bought a couple of packs for some shelving. If the 10 I needed, 2 failed. Unlike more expensive items, the screw plate at the bottom is only sheet material, so there are only a couple of threads for the fixing. I wouldn’t rely on these to carry too much weight. Rated 1 out of 5 by BorderDIYer from Very disappointed I am very disappointed with the quality of these metal cavity anchors. I put four of them into a wall and two of them failed. They must have deformed inside the cavity when tightening up and the 'bolt' then would not tighten when attempting to fix the bracket into them. It also made a mess of the wall when then attempting to remove them. Next time I'll spend the extra and buy a well known brand.